There have been recent reports of fraudulent e-mails being distributed that appear to be from the Department of Justice. In the e-mail the sender advises the recipient that the Department is issuing a summons so that the recipient will come to court. The Department did not send this e-mail or authorize it to be sent. If you’ve received a suspicious e-mail and wish to report it, contact the Canadian Anti-Fraud Centre, the agency responsible for dealing with fraudulent e-mails of this nature. 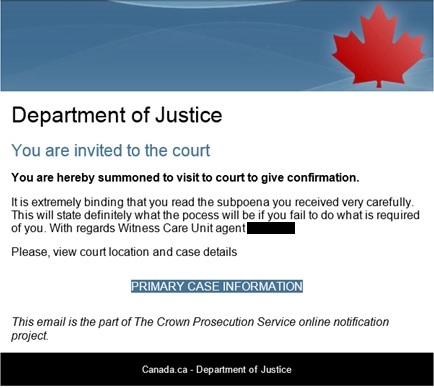 This is a screenshot of a fraudulent e-mail claiming to be from the Department of Justice that began circulating in January 2019. So far, only English e-mails have been reported. You are hereby summoned to visit to court to give confirmation. It is extremely binding that you read the subpoena you received very carefully. This will state definitely what the pocess will be if you fail to do what is required of you. With regards Witness Care Unit agent [REMOVED].